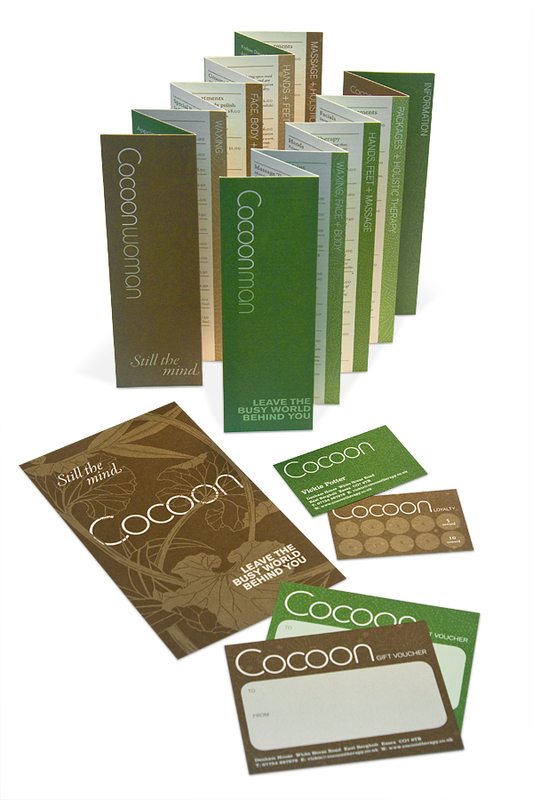 Here is the story of a recent project for a small local business; Cocoon Therapy. We were approached at the end of November last year by Vickie Potter. She needed various material for her newly established massage and beauty therapy business based in East Bergholt, Suffolk. She needed a brochure with complete price list, vouchers, business cards and promotional postcards all delivered by the end of the year. We met and discussed her requirements and the format for the brochure was decided; a concertina-folded booklet with women’s treatments on one side, men’s on the other. Concept one was chosen, which was further developed, then applied to all items required. The clean, contemporary typography is complimented with the use of monochromatic Japanese pattern and illustration. In order to make print costs as competitive as possible we liaised directly with a couple of printers. We decided that all items could be printed all up on a single sheet. 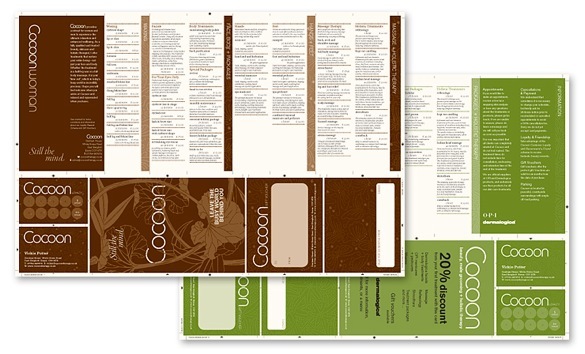 Printed in two colours on each side of the sheet (green or brown and black) also saved on production costs. An unusual cream uncoated stock, inuit tactile, was selected.